The Wicked. Oh how I love you! (I mean, look at this cover!) I finished this book yesterday and enjoyed it so much. It is like nothing I have read in a very long time. I received this book through my Nocturnal Readers Box subscription and I am so glad they included this. This book is true horror – the entire book teemed with the classic feels of 1980s horror. I grew up loving all things horror – watching movies like The Gate, Fright Night and Halloween over and over again, in addition to reading anything in the genre I could get my hands on. 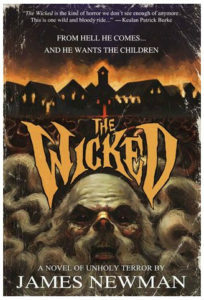 In this one we have the classic tale of evil taking over and almost completely annihilating a small town- the pace of this book is very fast moving and the imagery is solid and disturbing. Some of the deaths scenes….damn, that Moloch is harsh! In the beginning I wasn’t sure if I was going to enjoy the main characters, as they are very different from myself, but I did grow attached to them and ultimately was really rooting for them to survive the bloodbath. My favorite character was this older gentleman named George who was really just a smart-ole’ battleax (these types of characters always tended to be my favorites in old horror movies as well). They provide a bit of humor and a sense of comfort, being older, and that they always know how to tackle a situation. If you are looking for a true horror read, I would definitely recommend you check out this book, you will not be disappointed! *One aside, there are some strong sexual elements in the story so if you are a more ‘sensitive’ reader to that type of situation, you may wish to steer clear.